They're magical because although the pattern is utterly plain Jane (straight stockinette with a ribbed cuff), the yarn I used was inspired by the character "Hedwig" from the Harry Potter series. "Opal" has a line of Potter-esque sock yarns they created in conjunction with the release of the 6th movie ("Harry Potter and the Half Blood Prince or, as it appears on the label "und der Halbblut-Prinz.") The line has been discontinued, but I was able to snag this skein, along with a few others at a yarn store in Studio City! So far I've knit these and the "Dumbledore" pair. 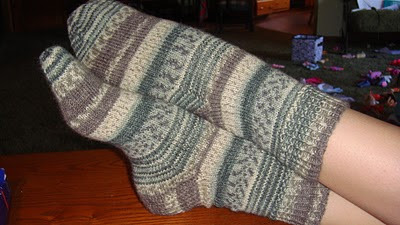 I seem to be on a sock jag because before I even took pictures of these I cast on yet another pair. Oh well, I suppose no harm can come from cozy feet! And yes, those are dolls strewn all over my floor. We just received a huge bundle of doll clothes we bid on from ebay and the girls are merrily enjoying their loot. Knitting and play -- it's a good day!